Lets talk P words! 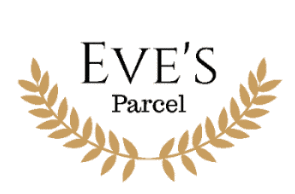 Eve’s Parcel is specifically designed to make your time of the month a breeze. 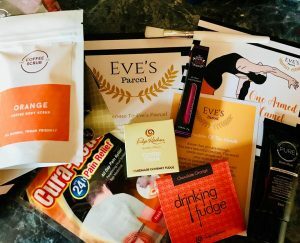 However, their main aim is to improve female well being and so ultimately Eve’s parcel is curated just for you when you need that little extra TLC. For me it’s been a postpartum pamper party. You don’t have to be on your period to have an Eve’s parcel delivery, neither do your P’s need to be regular. Conveniently you can choose whether or not to have sanitary products added to your package as well as tailor what type of product you need/prefer. Their ‘Trial Edition’ is the perfect way to experience Eve’s Parcel. Receive a one-off Parcel filled with pampering gifts with a total value of over 30 quid. With each parcel containing a mixture of indulgence products. Which also means (if you’re lovely like that) you can gift an Eve’s parcel to a sister in need. So, what did I get? An awful lot actually. Monthly affirmation – it’s always nice to be reminded how wonderful you are! Cougar candy coloured lipstick – I’ve literally found my lipstick; goes on like a gloss with a matt, 24 hour stain finish. I wasn’t exaggerating about the lipstick. All my life I’ve wanted to wear lipstick, but have never been able to find one that’s wearable/my colour/easy to apply etc. Only 37 years and that’s now been remedied. And that’s one of the beautiful things about Eve’s Parcels; you don’t know what you’re going to get! Eve’s Parcel strive to constantly find new products and brands to share with their subscribers. Which anyone addicted to unboxing will tell you is all part of the thrill. These parcels include all the elements required for a happy period. From treats for the three things affected most; mind, body and soul. To a variety of monthly beauty selections to promote relaxation and general well being. Use EVES15 to get 15% off your first box. And remember you can set your subscription to match your flow dates. Its time for your monthlies to be fun, period. *Eve’s Parcel supplied me with a free parcel to try out. However, this is not a paid advert and all opinions within this article are my own.